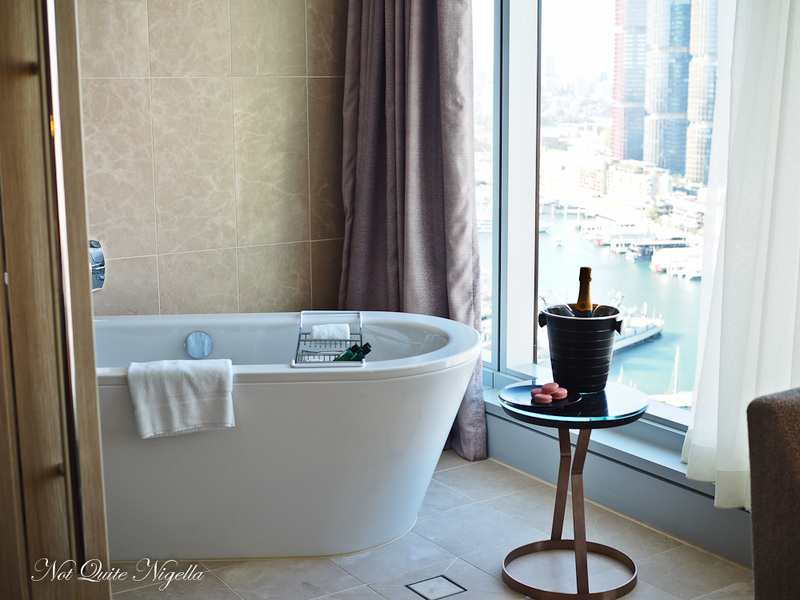 So Frenchy, So Chic: A Look Inside The Brand New Sofitel Darling Harbour! 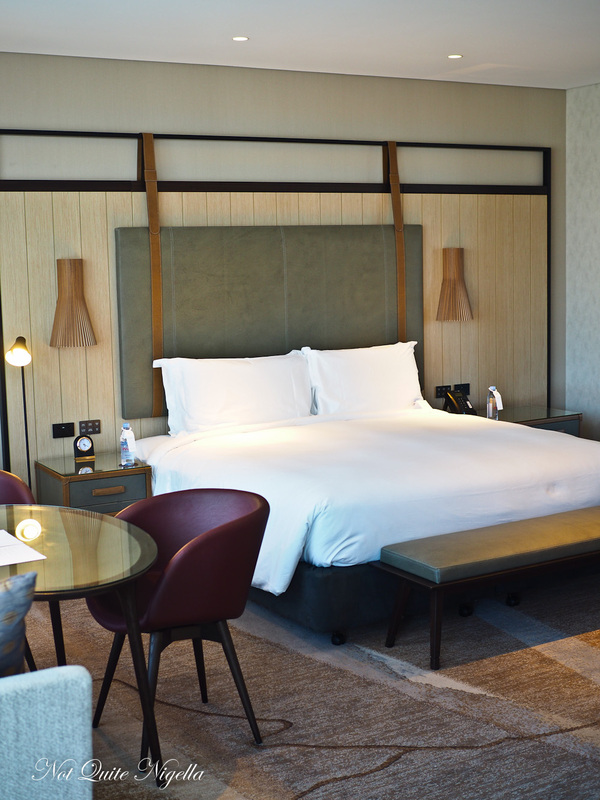 We take a look at Sydney's newest 5 star hotel, the Sofitel Darling Harbour and stay on its very first night of opening. 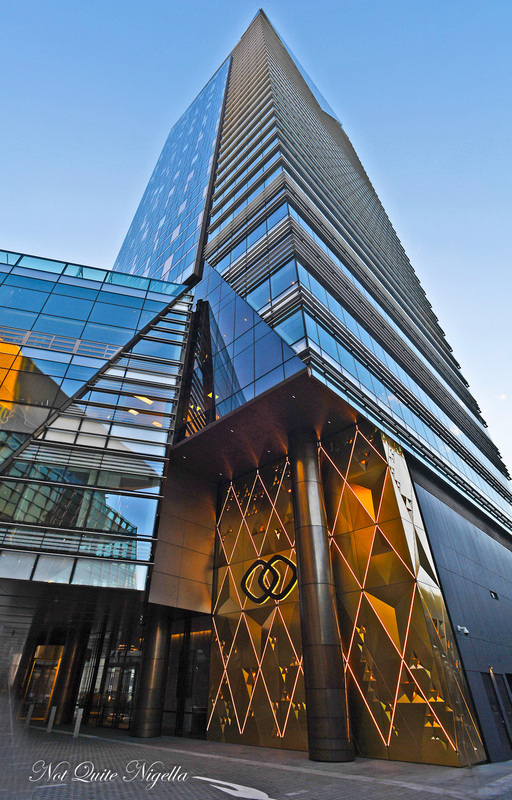 The luxury chain's new 35 story hotel is nestled in Darling Harbour right next to the International Convention Centre (ICC). 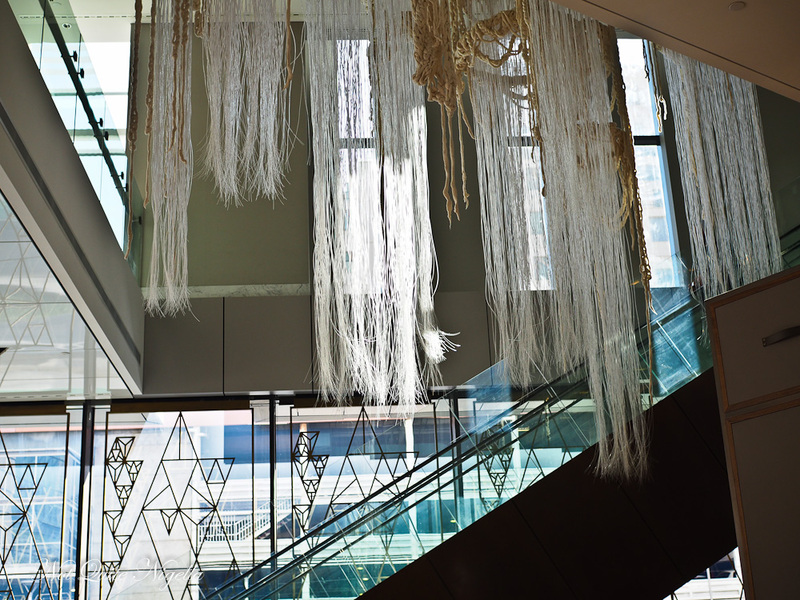 The precinct was built in tandem with a view to offer convention centre visitors somewhere to stay and do. But this isn't conference or convention accommodation with its feet firmly in the luxury category. Purpose built, the building is located right on the water, occupying a prime position. Although this is the first day of their official opening it's very busy and is at 60% capacity for the first night. The valet takes my keys and parks my car for me (although the $79 valet fee is a little eye watering). Sofitel is a French brand (its parent company Accor is French) and so the greeting from everyone is a "Bonjour!" when you walk in. 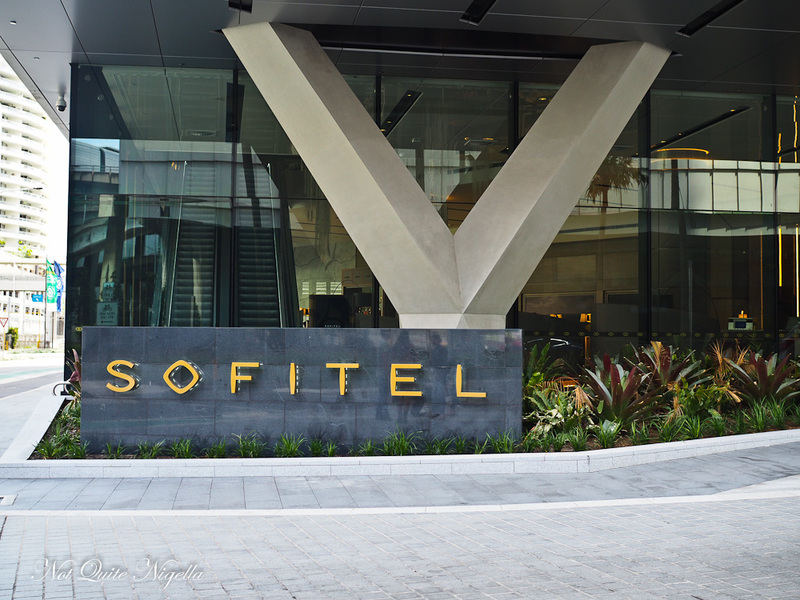 Each Sofitel has its own sister city that it is tethered to. 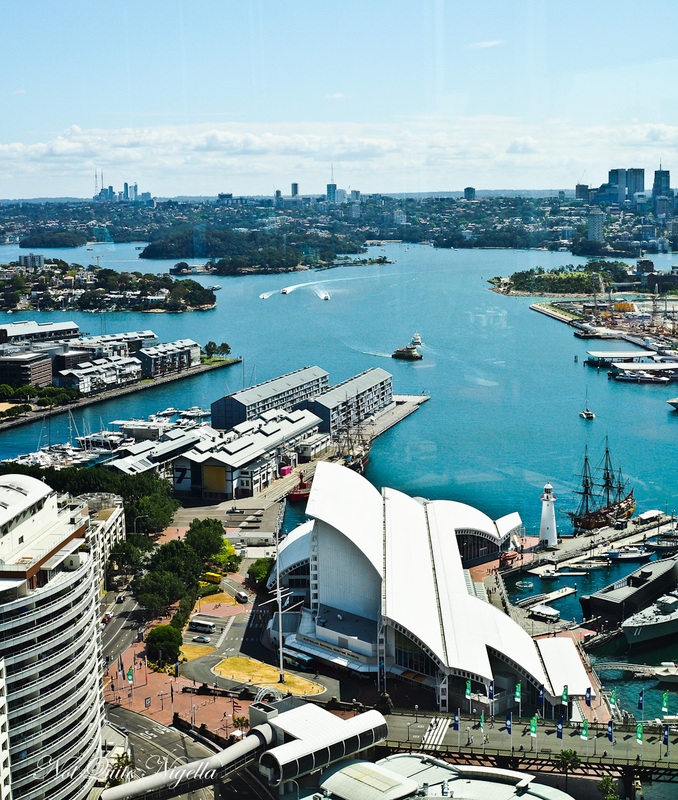 The Sofitel Darling Harbour's is Marseille chosen because of the joint maritime theme. The colours are red ochre and blue to symbolise the indigneous culture of Australia and the triangular motifs represent sails. The building was designed by Sydney architect Richard Francis-Jones from Francis-Jones Morehen Thorp architects. 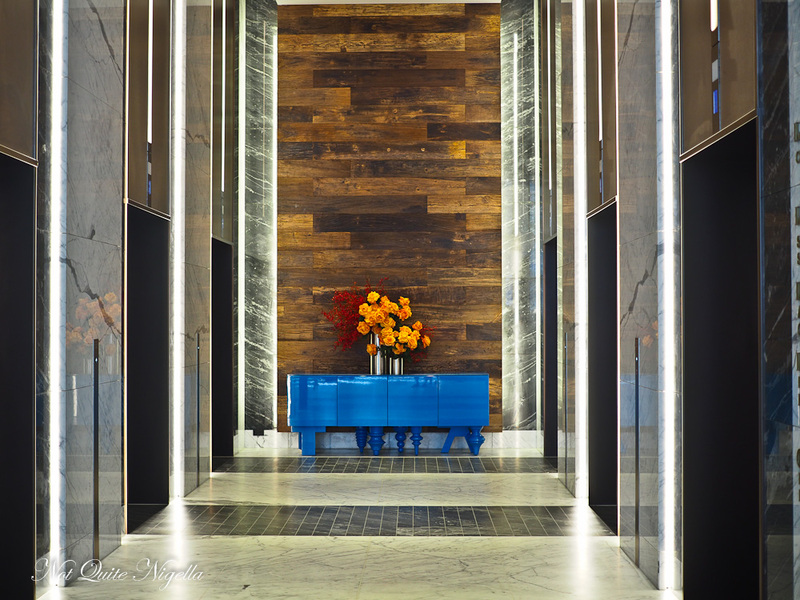 Dreamtime Australia Design and the A+ Design Group collaborated on the interiors. With 590 rooms including 35 suites, it is a big hotel. 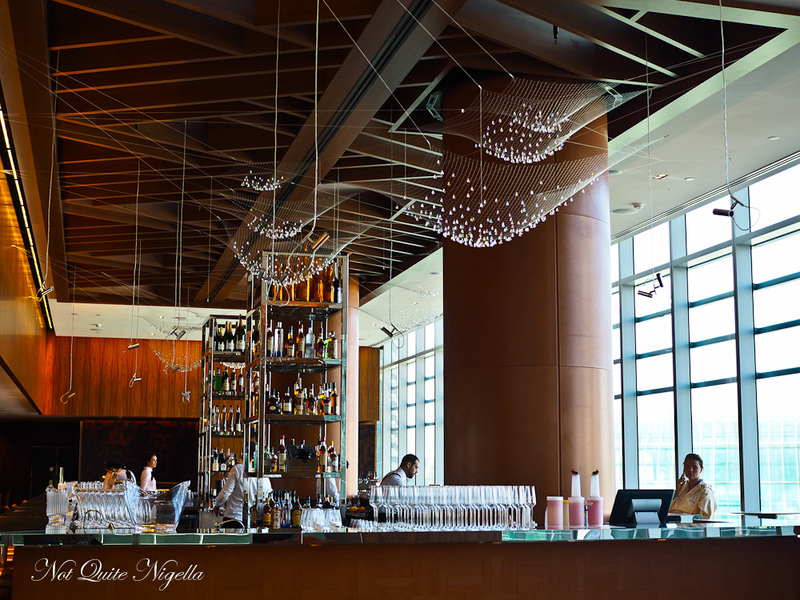 I look around and it is busy in the Esprit Noir lobby lounge and bar. Service is sleek and anticipatory, not what you'd expect so early on (the image of the swan paddling furiously underwater while remaining calm above water comes to mind). The only changes to be made in the lobby are the fish tanks. These will replace the black and white photographs of the South of France behind the reception desk. 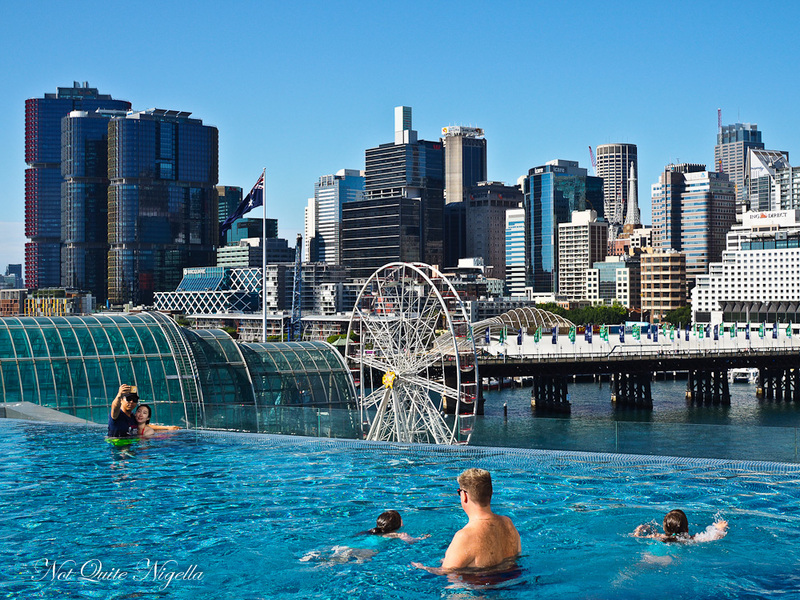 The 20 metre infinity swimming pool is located on the fourth floor along with the gym. 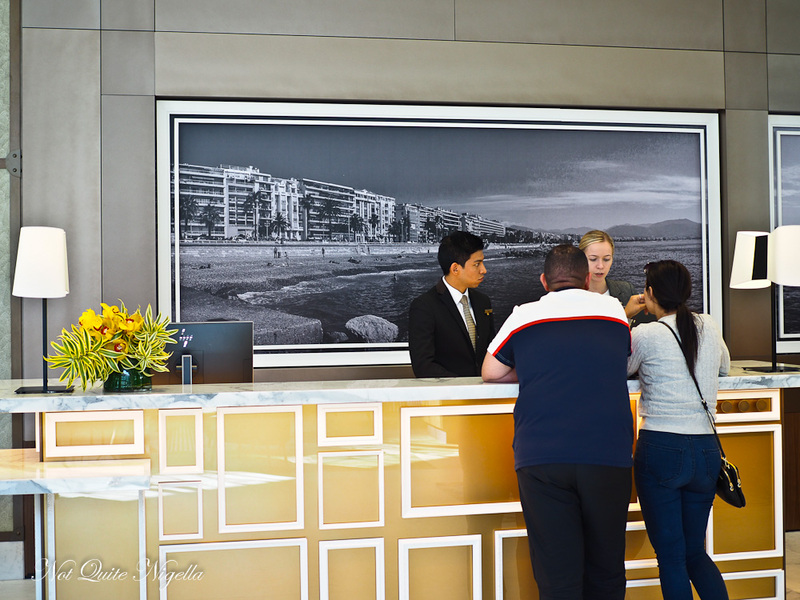 There's also the Le Rivage bar open until 9pm each night and the pool is a magnet for guests on this warm Spring day. 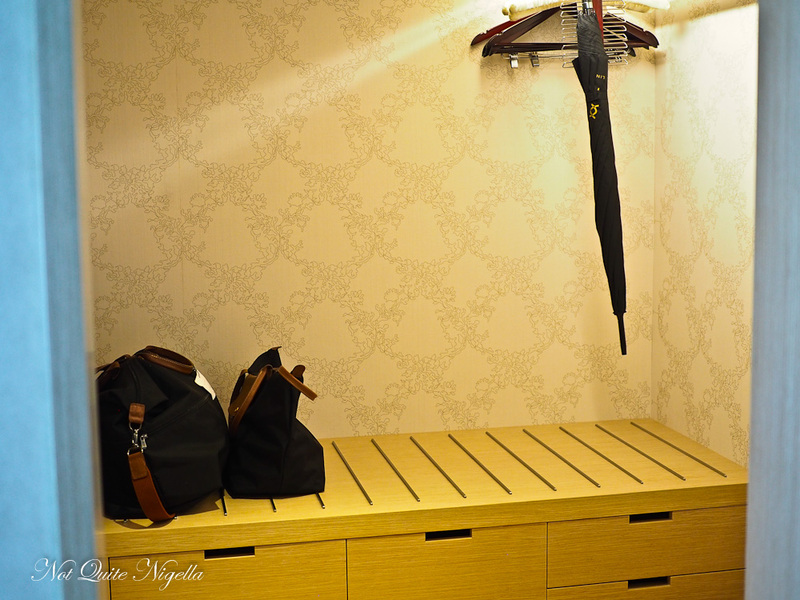 My room is located on the 27th floor and it is a Club Junior Suite, one of the 35 suites. It measures around 53 square metres and it's not a suite with a separate lounge area though. The king bed is very comfortable although the sheets will need time to soften. There is a large flat screen tv, coffee machine and TWG teas and a good quality mini bar. Wifi is fast and free for up to 3 devices. The bathroom is my favourite part. 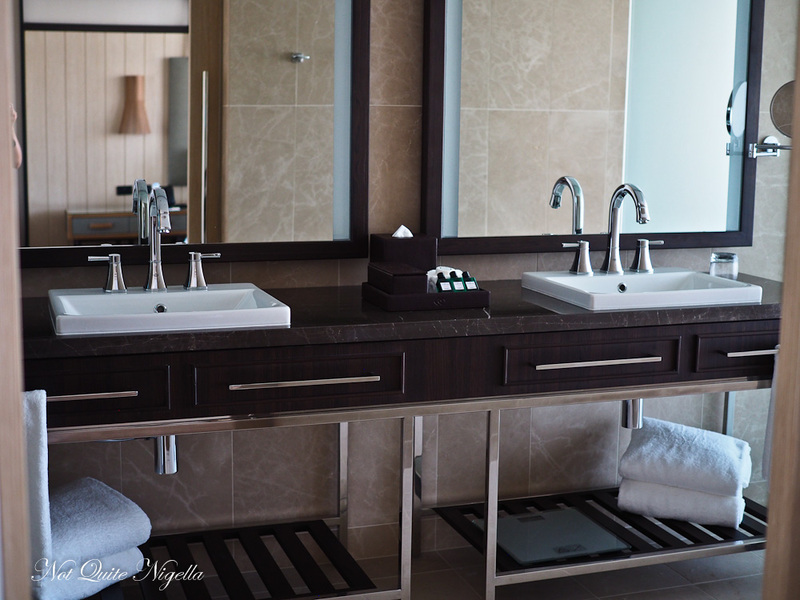 There are double sinks, a separate shower and my favourite part: a freestanding bath positioned so that it looks out onto the view below. There are a host of Hermes Eau d'orange Vert toiletries, a rather bracing scent. The towels are lush and absorbent. The bathroom television is a nice idea but the screen doesn't shut off and illuminates and flickers during the night through the glass panelled door. Executive floor guests staying on floors 27-34 also have exclusive access to Club Millesime Lounge on the top floor of the hotel. 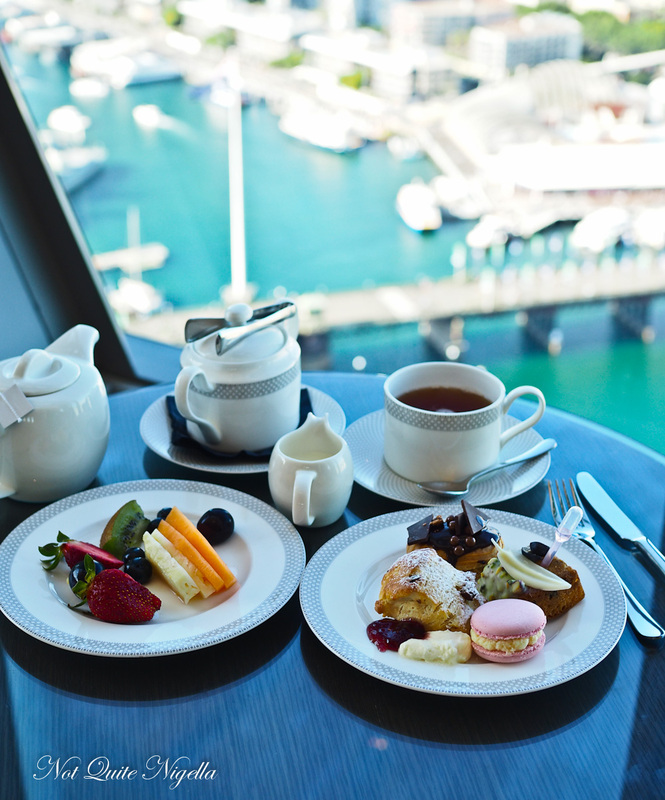 During 3-5pm people can help themselves to afternoon tea and drink in the view from the 35th floor. 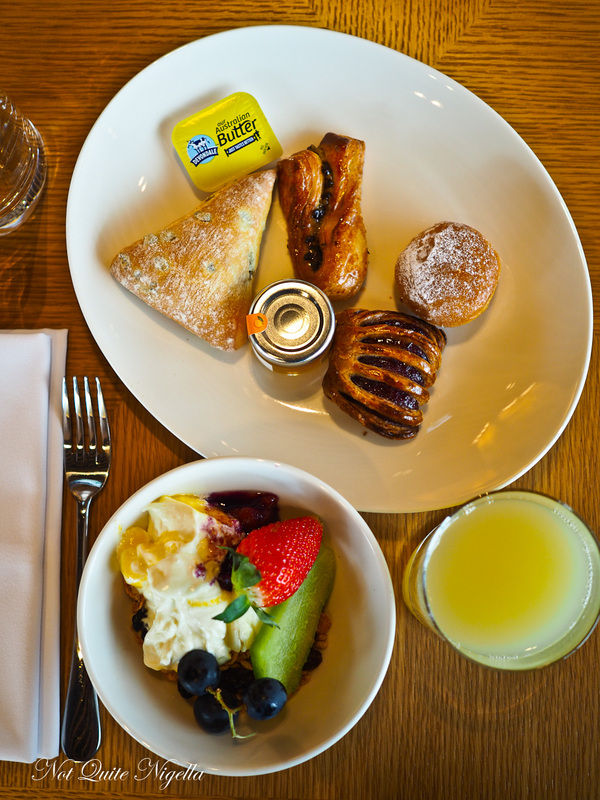 I order a pot of Earl Grey tea and help myself to fruit and pastries. The third floor is where the restaurant Atelier and the Champagne Bar are located. 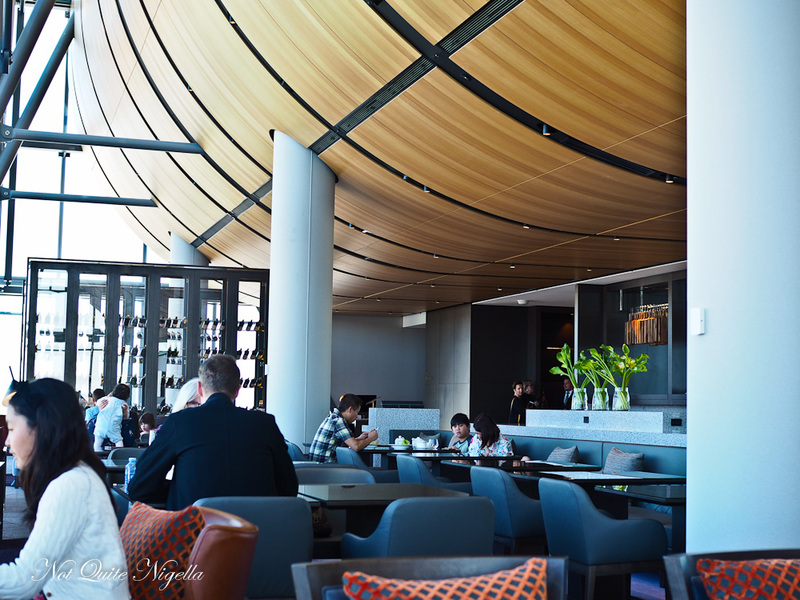 It's Sydney's largest champagne bar and seats 110. 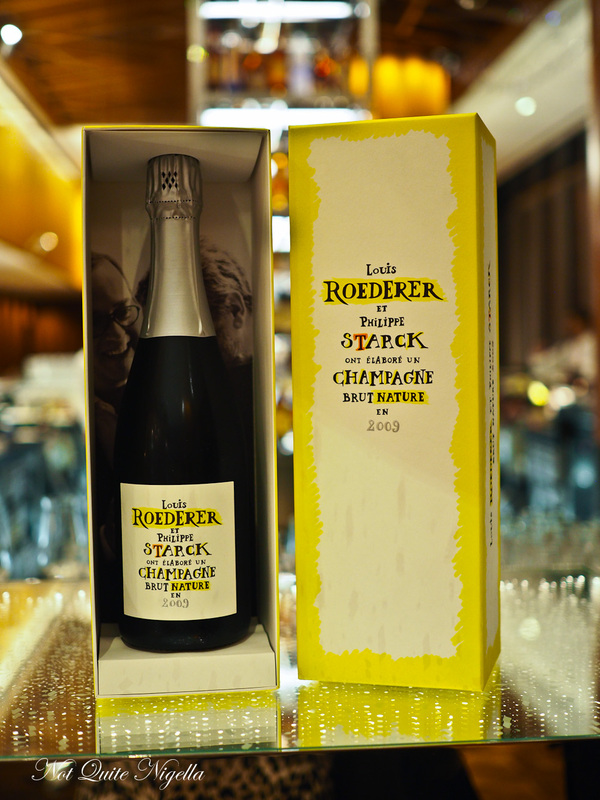 You can order from a range of 20 champagnes including smaller champagne houses like Canard-Duchene to a glass of the 2009 Louis Roederer Philippe Starck collaboration at around $500 a bottle. Or if you're feeling truly flush they are the only hotel in Australia to stock a 3L bottle of Cristal Brut. The bottle is surrounded by 24 carat latticework dipped in gold in a four day process. And the cost? Just $22,000. Next to this is Atelier, a large 220 seater restaurant. Executive chef Matt Coates is from Melbourne's Crown Casino. 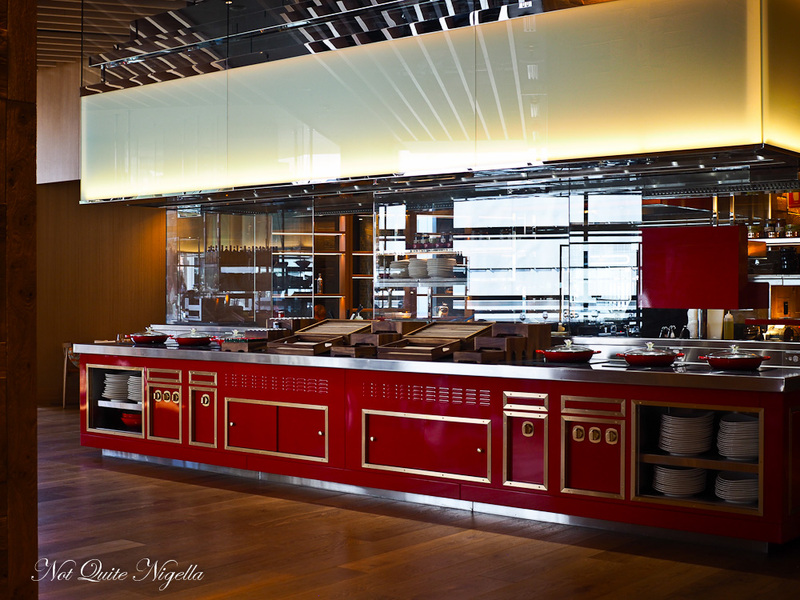 It's a very large space with three separate kitchens located among the tables: a hot kitchen, a grill and a cold kitchen. 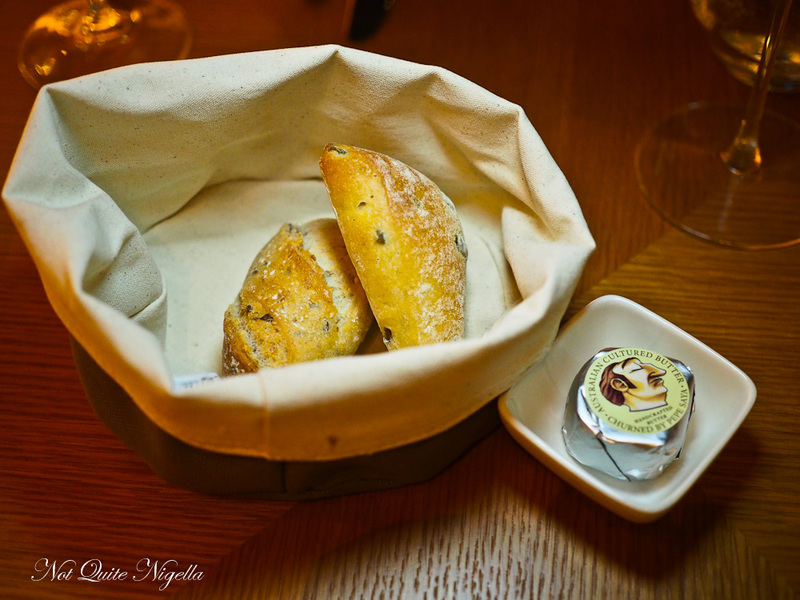 Service from the staff is really lovely and helpful and we start with warm olive and seeded bread with Pepe Saya butter. Mr NQN's choice is said to be the signature dish, designed to reference Marseilles. 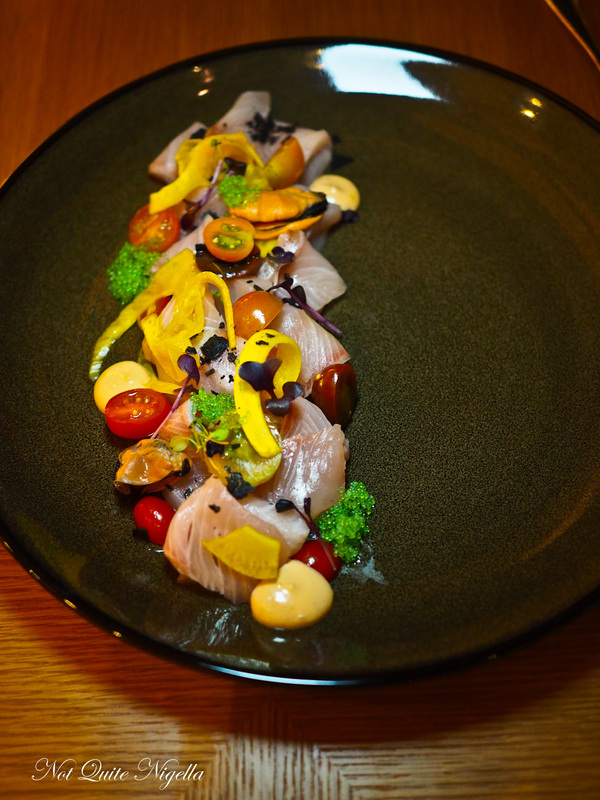 It is a deconstructed bouillabaisse with yellow tail crudo, black mussels, saffron fennel and flying fish roe with a spicy aioli. Mr NQN is a big fan saying that he prefers this to actual bouillabaisse soup as it's all about fresh fish and luscious textures. 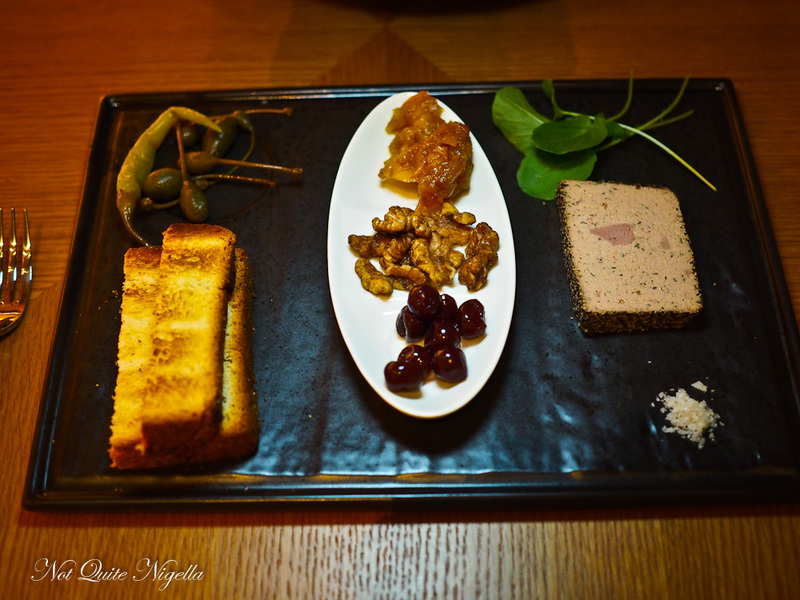 My entree is the chicken liver pâté served with plenty of accompaniments from slices of toasted brioche, liqueur pickled cherries, caperberries, pickled green chillies, quince chutney and toasted walnuts. The pate is smooth and goes well especially with the chutney and caperberries. The mains are broken up into two sections on the menu. There's a "Share" section with dishes meant for two or a mains section. 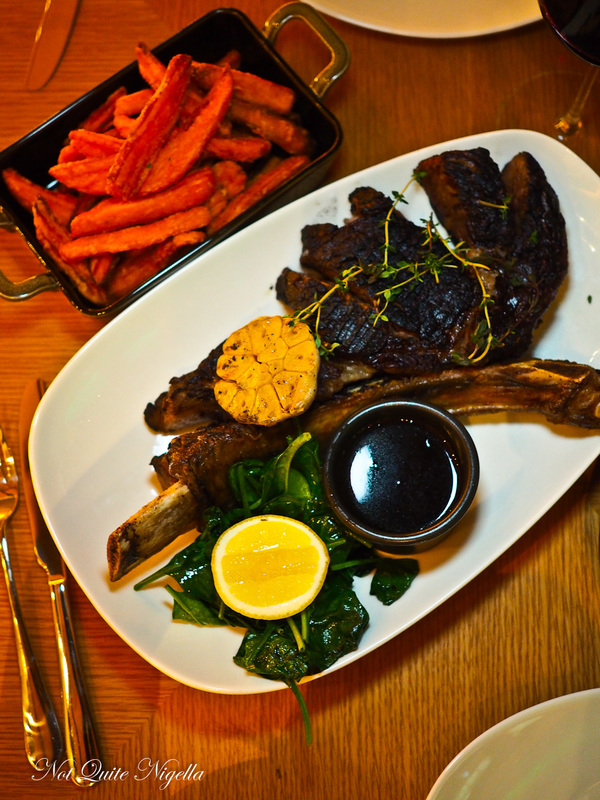 I'm drawn to the tomahawk steak, an enormous beast around 1.2 kilos. 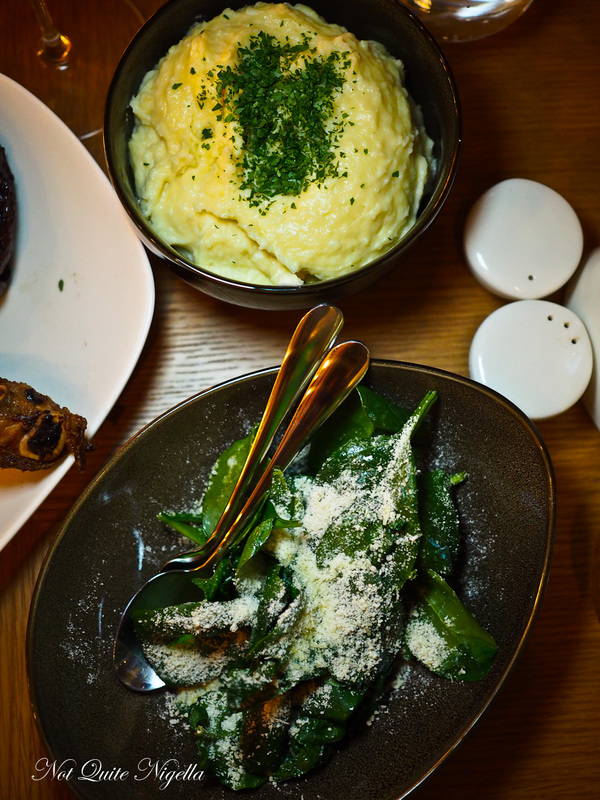 It's served with garlic confit and wilted spinach and we also order a range of sides to go with it including triple cooked sweet potato chips and Paris mash. It also comes with lemon and a pot of demi glace style sauce. The Paris mash topped with chives is generously portioned and the chips crunchy. The steak is an excellent dry aged grain fed steak. With a perfect char on the outside and medium rare on the inside we feast on this until we can feast no more. Until dessert that is. My dessert is an ode to one of my favourite flavours: coconut. 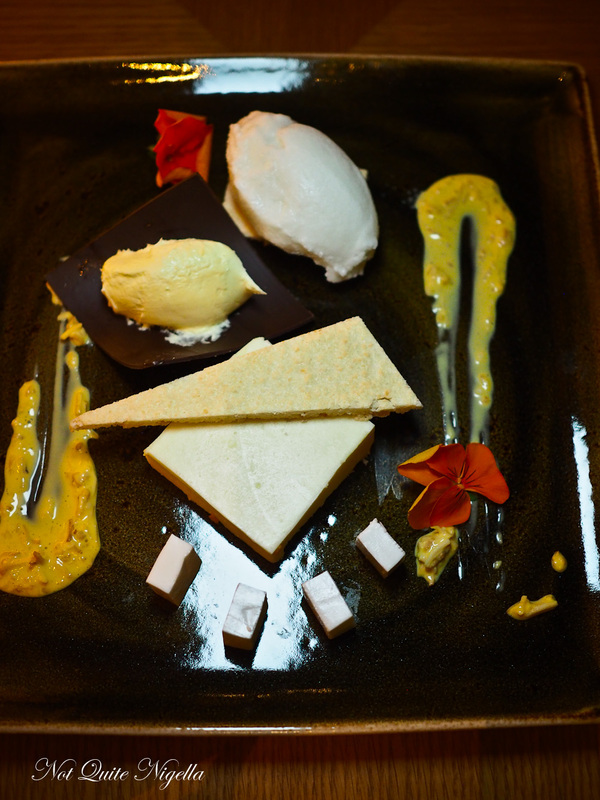 It's lots of different treatments of coconut from a jelly, crisp, ice cream and a square of coconut cream pudding. It's not bad but it really needs some sort of acidity to it like passionfruit or lime. We both prefer the Berry Four Play with a berry cake made with strawberry sponge and frozen blueberry creme patissiere, raspberry cremeux, blackberry chibouste coated in a berry glacage. There are tiny dehydrated meringue puffs and a scoop of wild berry ice cream. 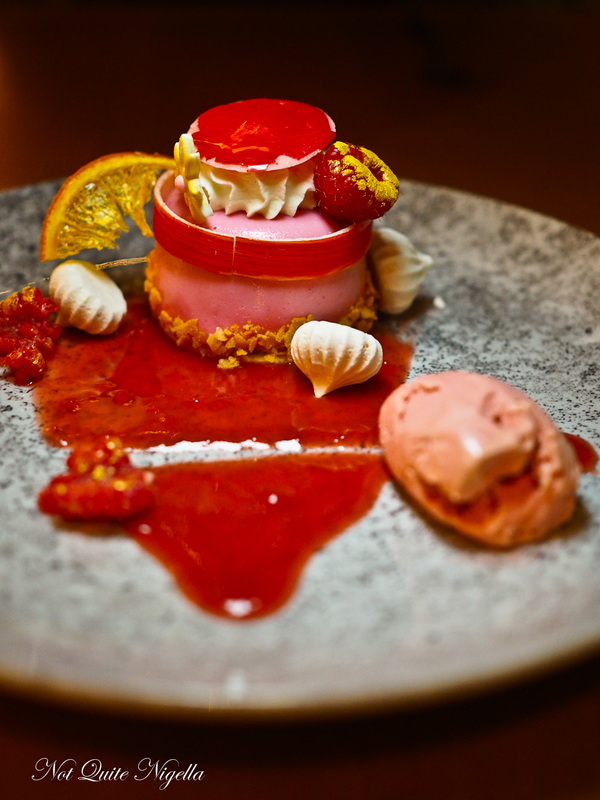 This is not only pretty but a lovely dessert too. We run a bath watching the twinkling lights below and go to sleep and wake up next day for breakfast. Or make that two breakfasts. Because for research purposes, we had to try both ;). 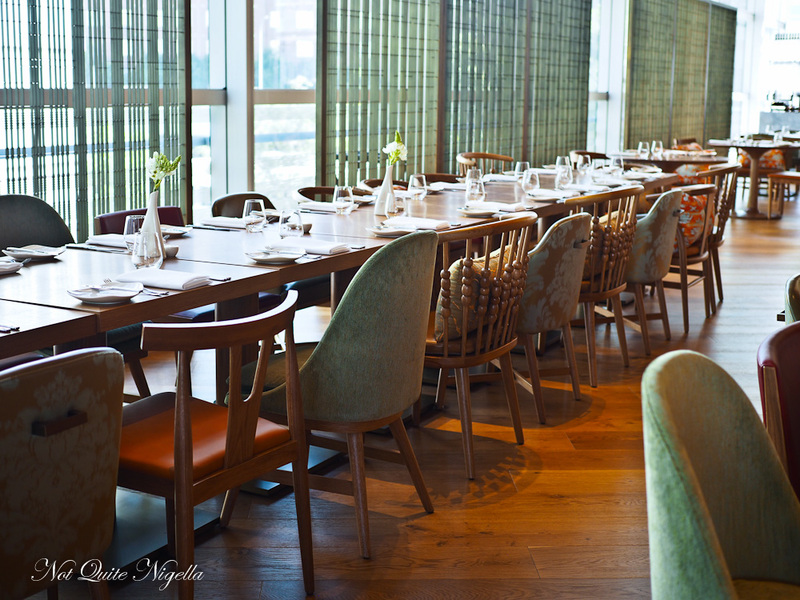 We make our way down to Atelier on the the 3rd floor. Breakfast finishes at 10:30am on weekdays and 11am on weekends. It is very busy here and there's a queue to get a table. 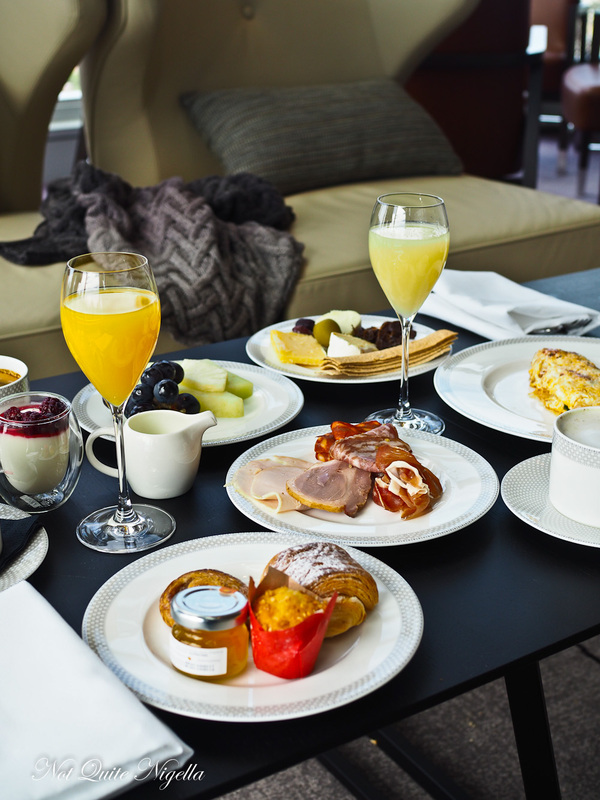 There are three stations: hot food with omelettes cooked to order, a cold fruit and yogurt station and a bread station. We have some fruit salad and some pastries. The pastries are very good as they're crisp and fresh. Then we make our way up to the 35th floor to Club Millesime. It's a very different atmosphere. It is much calmer and you just see yourself to a table so there isn't a wait or a queue. The buffet choice is actually quite similar to downstairs, the only difference is table service. They also offer freshly made omelettes and eggs. We enjoy the food and atmosphere much more here. It's more relaxed and there's also that gorgeous view. 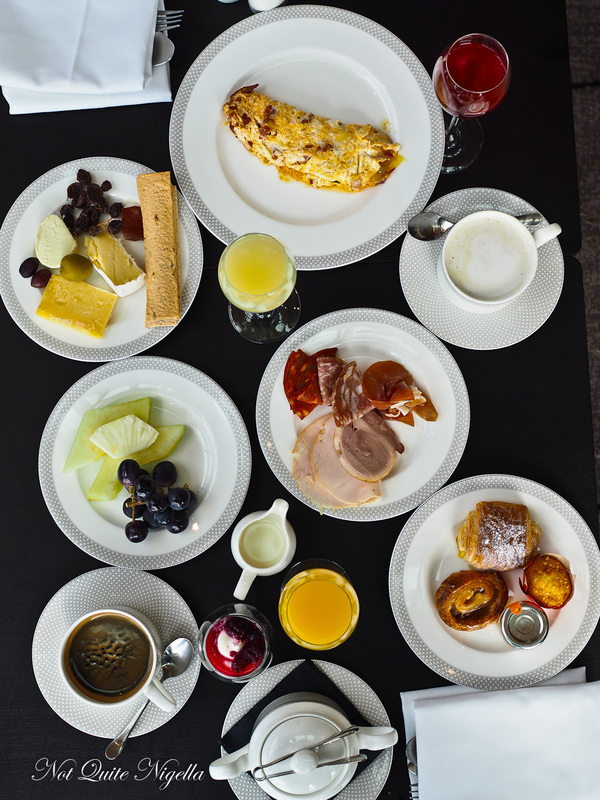 There's just as much cheese, charcuterie, fruit and pastries here and the only thing that is different is the fried rice and congee but other than that the best way to welcome the weekend is brunch 35 floors up. With that view. Did I mention that view? So tell me Dear Reader, do you try and book club floors to access the club lounge? Do you ever eat enough in the lounge to make it your dinner? And have you ever stayed at a hotel during its opening week? 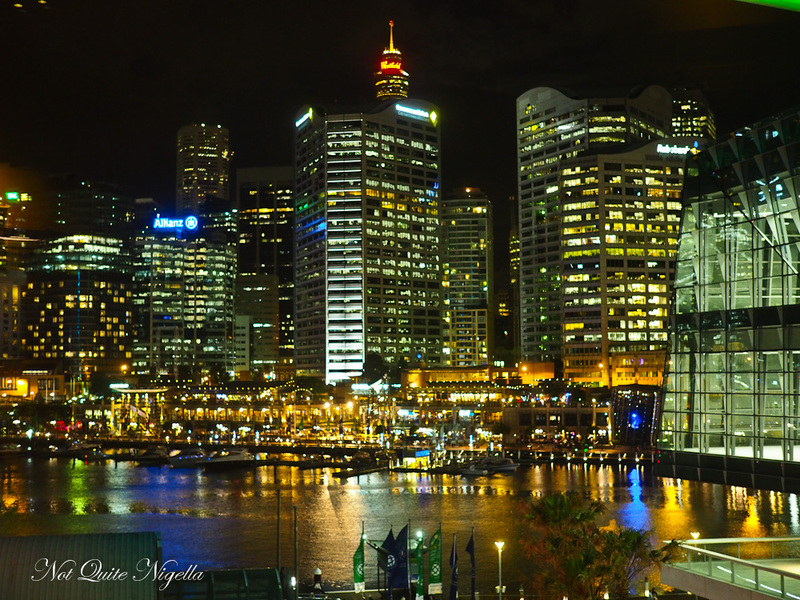 NQN stayed as a guest of the Sofitel Darling Harbour but all opinions remain her own. 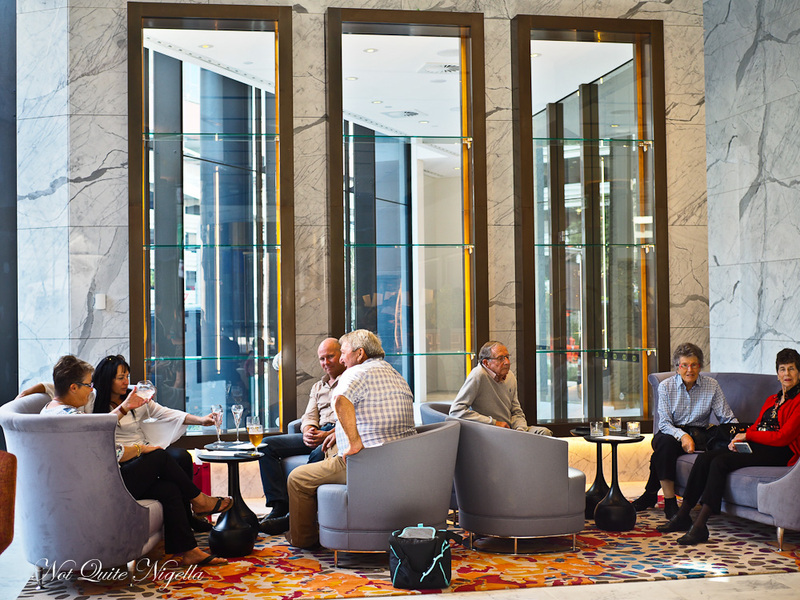 restaurantA Staycation at the InterContinental Double Bay! 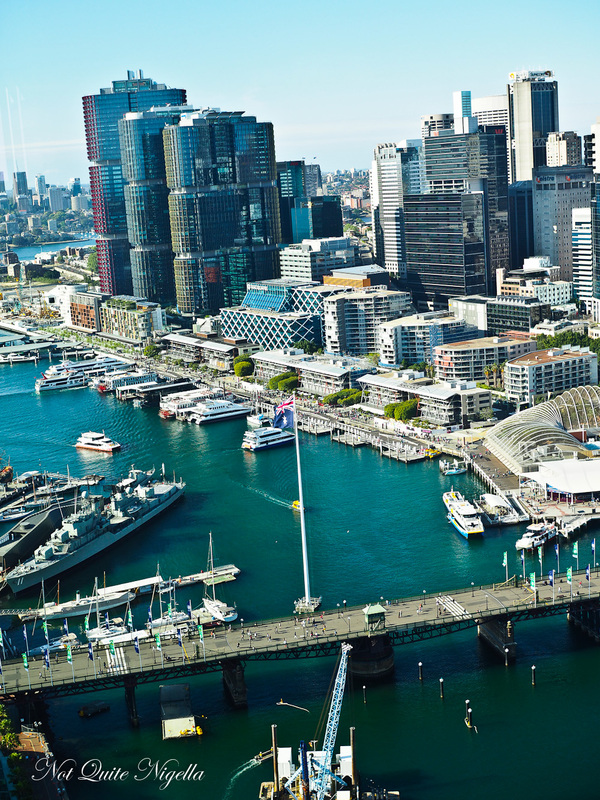 restaurantDining at 40 Metres Above The Ground on The Ferris Wheel at Luna Park! 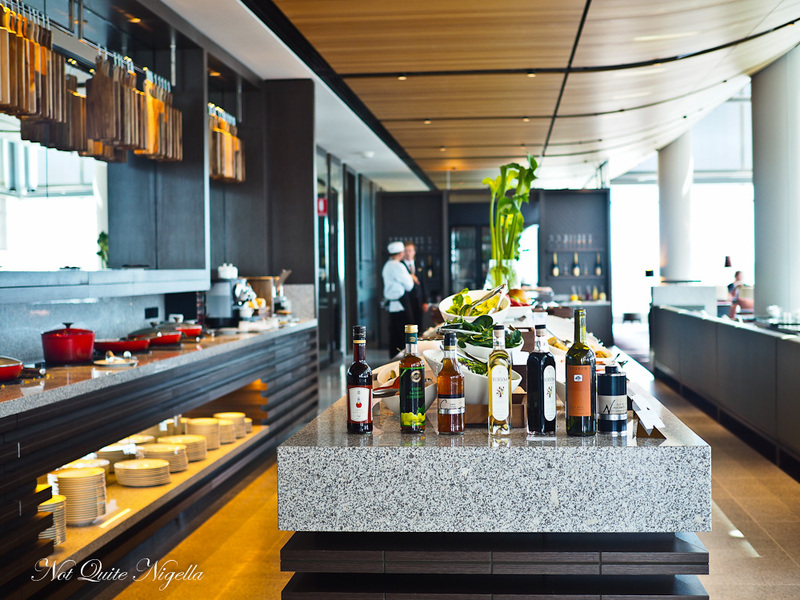 restaurant A Staycation at the InterContinental Double Bay! restaurant Dining at 40 Metres Above The Ground on The Ferris Wheel at Luna Park!